If you are getting ready to go on vacation in Santorini, you should prepare yourselves to explore and discover its beauties and wander in its villages and beaches, as well as the sights that make it so special. North Santorini is an ideal place to start your tour with a hire car, as it includes some of the most beautiful settlements on the island. Car hire in Santorini is necessary for your transportation as the island, due to its particular morphology, is not known for its public transportation. The most known and important sight in North Santorini is of course, Oia. A traditional settlement on the island, but also its most touristic part, known for the stunning sunset, it is located 11km away from Fira and almost 15km from Santorini Airport. Oia is built 350m above sea level; it’s worth visiting Oia to admire its amazing architecture, with the cave houses dug into the rocks. This type of houses is found only in Santorini, due to the particularity of its soil. Oia is a tenable and preserved settlement. You can leave your car hire at the peripheral road and walk in its narrow and picturesque cobblestone streets, visit the several tourist shops, restaurants offering magnificent view to the volcano but also the romantic bars settled somewhere among the cave houses. If you do not want to go 214 steps down from Oia to reach the beach of Amoudi, or you are not willing to try your donkey riding abilities, you can take your car hire or your rental bike and reach one of the most calm beaches of Santorini driving: Koloumbos is located 4km away from Oia and is a nice and quiet beach with small pebbles. A few kilometers north from Fira you can find Imerovigli, a typical Cycladic village with white washed houses, narrow streets and picturesque kalderimia (cobblestone paths), and the traditional Churches of Santorini with the blue roof. 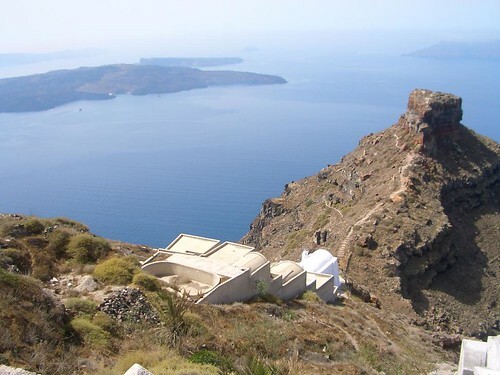 Imerovigli is built on the top of the crater and offers the most breathtaking view to the volcano, after Oia. Imerovigli is also referred to as ‘the balcony’ of the Aegean, due to its stunning views. The village itself is very beautiful as well, and ideal for a leisurely walking, thus, you can leave your car hire and walk along the edge of the rock enjoying the setting. Just a little further from Imerovigli, lies the castle of Skaros that dominates the setting, strategically located in order to control the entire island. The castle is considered to be exceptional, since it never gave in to the Venetians, despite the 300 years of their occupation of the island. 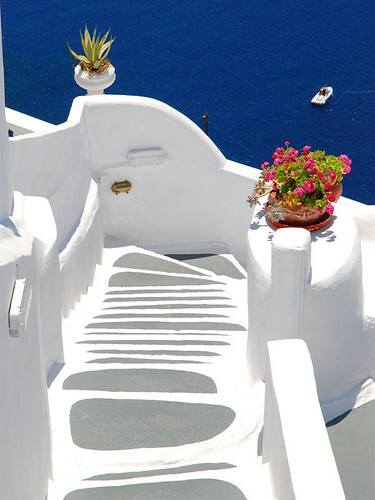 If you are interested in something more traditional and less popular, you can visit Foinikia Village, 10km NE from Oia. Foinikia is a very small settlement, with less than 100 residents, but it is known due to its spectacular entrance: a large volcano rock. The village, although small, features quite many local taverns with traditional local food and products. 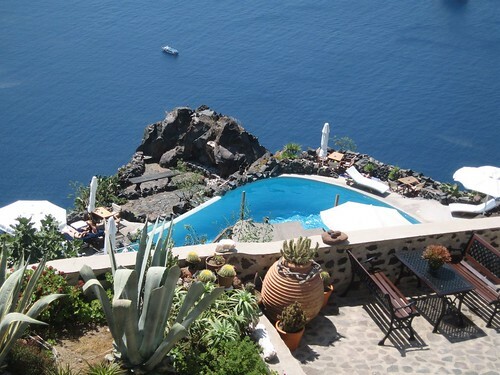 North Santorini is renowned for its beautiful and neat small villages and the amazing view to the volcano, therefore it is worth hiring a car in reasonable and affordable price and discover why the island is considered one of the most beautiful settings in the world.